 No fewer than 24 contemporary Scottish writers are represented in this vivid, all-encompassing anthology, poets and essayists included, though most are fiction writers. Familiar names--such as Trainspotting's Irvine Welsh, The New Confession's William Boyd, and Morvern Callar's Alan Warner--mingle with others who deserve to be better known in the US, among them Janice Galloway and A.L. Kennedy, both prize-winning novelists whose stories dispel any misperception here of the current surge in Scottish literature as a predominantly male phenomenon. From Welsh's view in the vernacular of a soccer enthusiast, whose plans for watching the weekend match on TV are modified somewhat when his wife's legs are removed by a high-speed train as they cross the tracks while hurrying home from the pub (``A Fault on the Line'') to Kennedy's New York story of a young woman whose desert dreams and violent fantasies have no room in the ``perfect'' relationship she's enmeshed in (``Rockaway and the Draw''), these are often tales of savagery, whether accidental or suppressed, blackly humorous or between-the-eyes serious. The trademark images of punks and ravers made popular by the Scottish Beats are here as well. But as the anthology makes abundantly clear, these writers claiming Scottish kinship are onto something more universal, poking into the basics of the human condition in a way that makes for uncommonly good reading. 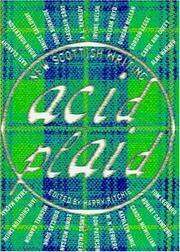 A memorable collection, with a crisply contextual introduction by Ritchie.